Discover one of the most beautiful places in the world, where the Danube meets the Black Sea. 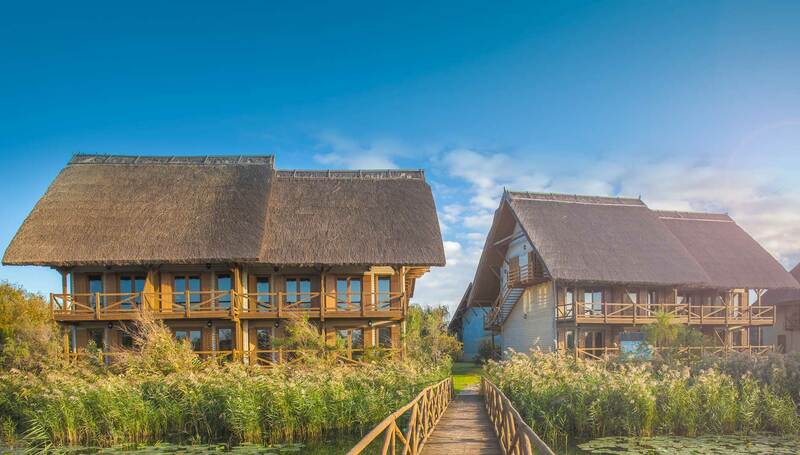 Green Village Resort combines adventure and wildlife with relaxation and comfort, in a unique place for your vacations: the Danube Delta paradise. 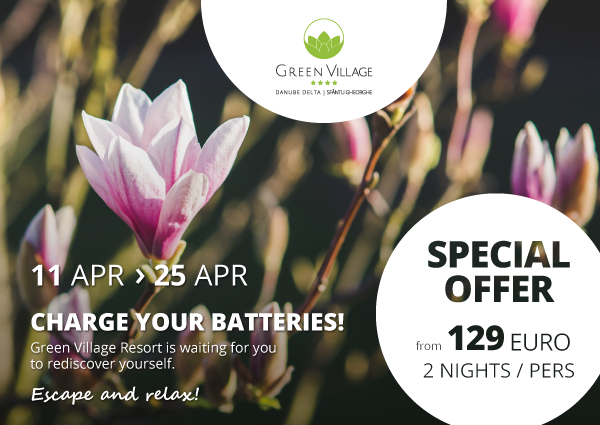 Your vacation begins at Murighiol, from where our dedicated staff will take you to Green Village Resort Sfântu Gheorghe. Start with a ride down the canals, surrounded by nature, letting the fresh air clear your mind and providing you the unique experience you are searching for. 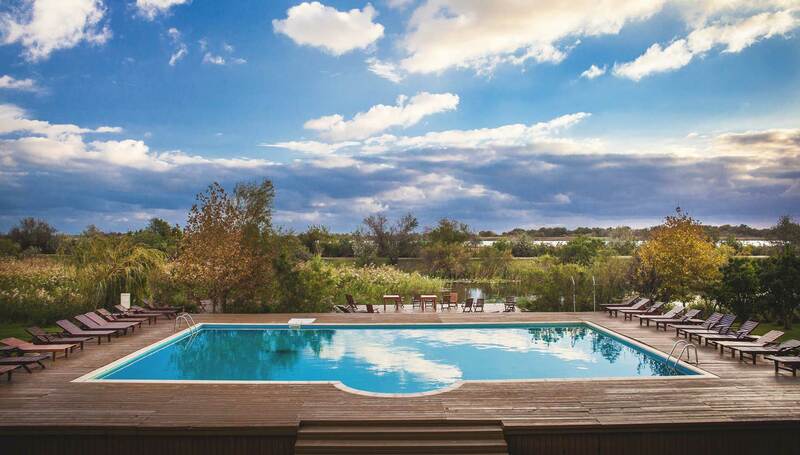 This is a quiet place – the Egreta Area is a relaxed and intimate spot, where you can enjoy premium facilities, such as Jacuzzi, River Bar, Bayside Fitness. 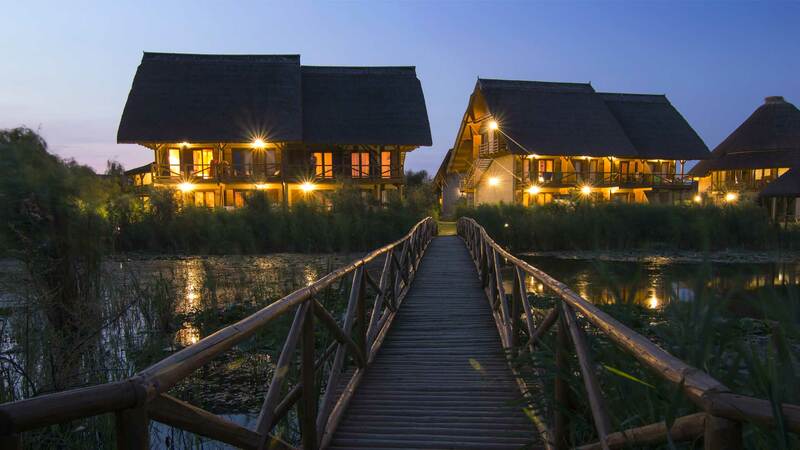 More than a simple accommodation area – we also added a series of facilities, such as the Waterlily Restaurant, Cinema Paradiso, Lotus Spa and many others. 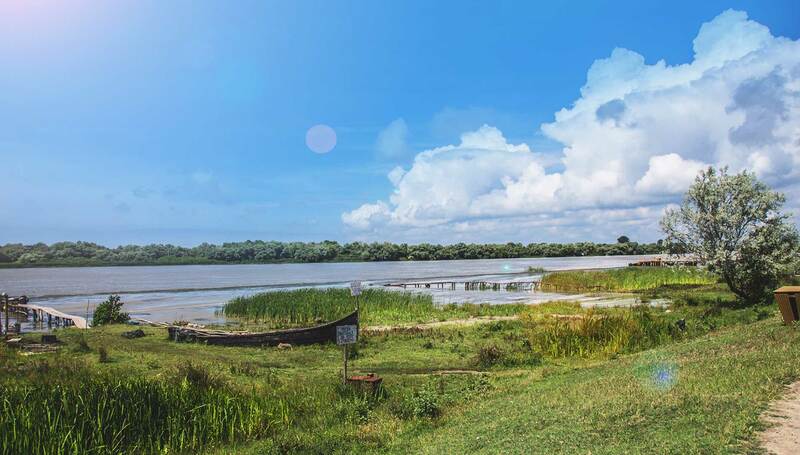 This is where we have fun, we tell stories and taste delicacies specific to the Delta area and we fall asleep thinking of the wonders we will see tomorrow. 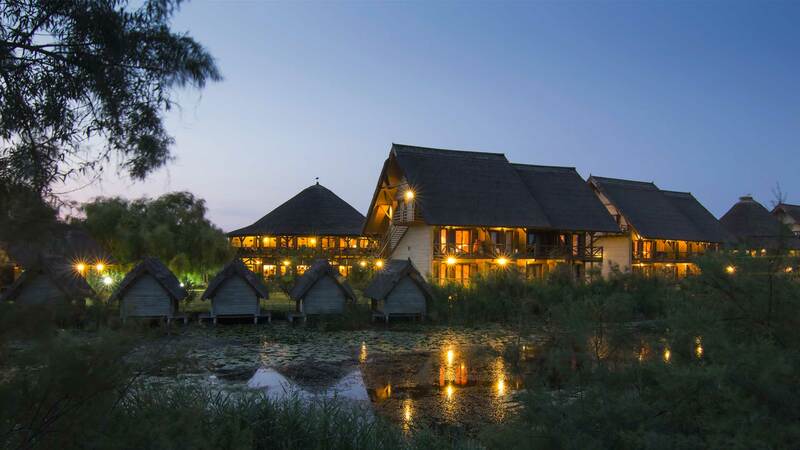 A wide accommodation Area, with bungalows covered in thatch, in an authentic natural environment – enjoy the view of the lake crowned by reed, bulrush and willows, on your way to your room, feeling more and more like you are in paradise. 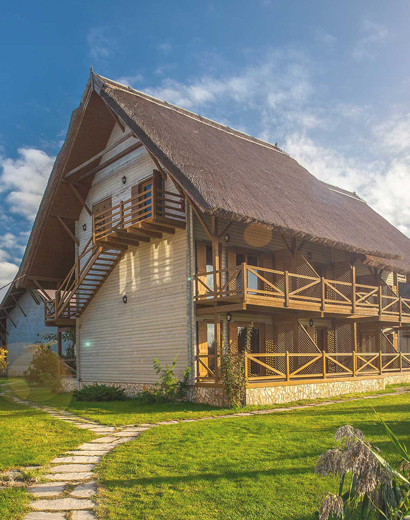 We created the resort with particular attention to details, while keeping in mind the desire to provide a new activity each day for our guests – from cycling to kayaking, on water or land, you don’t have the time to get bored in Green Village Resort! The beach is not far, but you can rent a bicycle to get there – a bit more exercise doesn’t hurt! Our instructor will help you start your day full of energy, in the pool, with a Pilates class. Ready-to-rent kayaks are waiting for those with adventure in their blood – start your adventure on the channels, in the search for mysteries. We have also prepared guided tours – all you have to do is relax and let the Danube waves carry you away. 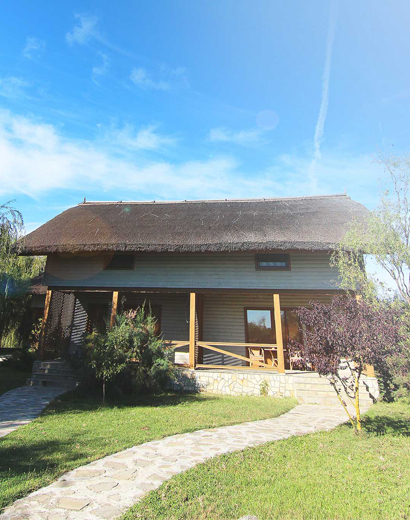 Kids will have a wonderful time here, enjoying the best games, stories and activities. The cool gazebo on the lake shore is waiting for you to just grab a book and swing in the hammock. We organize beach football and volleyball tournaments, in our very resort. 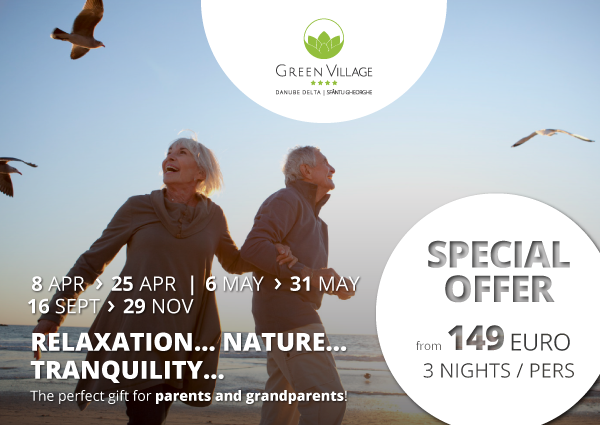 Come prepared and let’s have fun in the Green Village Resort! We show movies indoors or outdoors, every night. We also have a popcorn machine! 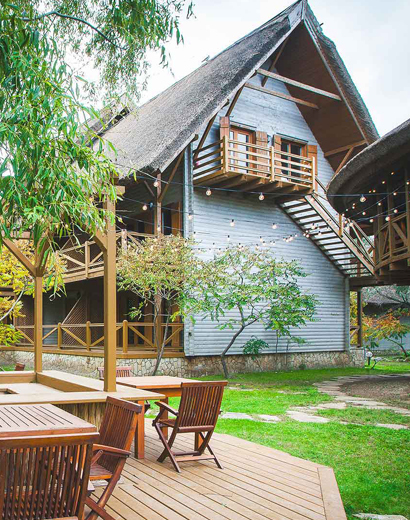 We know that images capture the uniqueness of the Danube Delta and the exotic feel of the Green Village Resort, but the experience is not complete until you reach these fairy-tale places – the photographs will make for beautiful memories, after your vacation! Of course, you can personalize your vacation according to your taste and needs, but it might help you to have a look over the packages we created – maybe you find your ideal vacation!